Up until now you’ve taken any and every excuse to break from your healthy habits. Your birthday, Christmas, vacations or even your co-worker’s retirement party would start an avalanche of bad food choices. Now that you’ve anchored yourself in the process of your healthy lifestyle, learn to take slip-ups in stride, rather than letting it turn into a landslide. You’ll spend a couple of weeks eating clean, exercising and losing weight, but then the pendulum swings and you spend the next week or two indulging in your old unhealthy habits. After enough “chubby” days you’ll get back to your clean habits, and so the yo-yo goes. It’s time to stop this vicious cycle that never brings you all the way to your goal – keeping you comfortable enough, while also completely frustrated. The good news is that your yo-yo days could be quickly and permanently turned off with this simple mindset change. Find your reward in the process, not in the results. When it comes to weight loss, we’ve been brainwashed to focus all of our efforts on the “results”. Your desired result is the ideal “summer” body that you dream to have – it’s your reason for passing on dessert and the image you hold in your mind as you toil through burpees and mountain climbers. News flash: If you only focus on finding rewards in the results, you’re likely to fail. Think about it. Results are abstract. Oh sure, you can picture that toned swimsuit body on the beach in your mind with crystal clarity, but what reach does that image have on you when you’re lured into the drive thru or have those late night cravins? Let’s face it – future results are easy to lose focus on during current events and activities that we come across in our daily routines. The Process: this is the act of working toward your goal – your meal plan, your exercise routine and your healthy life style choices. If you had a map of where you are today (blue dot) and where you’ll be when you reach your goal (red dot) the process is that black line connecting the two. When all you’re focused on to reinforce your journey is the promise of results, it’s easy to wind up lost. Finding Reward in the Process: Make a new habit of feeling rewarded after every day on your chosen path. Learn to find healthy habits, activities and new healthy foods as the reward you are after. For me, there is nothing more rewarding than having the freedom of being out on my bicycle riding up the coast all by myself with just my thoughts and the ocean breeze. I know that when I reward myself with this process enough times, my results will eventually happen. But make the results the bonus to the rewarding process. Let the completion of your healthy diet and exercise each day become its own reward. Look down and applaud yourself for each step forward. As soon as you are ale to make that the reward, all of the results will happen on their own! I’m passionate about helping you find your way to a healthy lifestyle. Call or email today and I’ll get you started on an exercise program that will turn the process into a rewarding adventure. 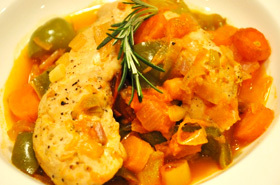 Here’s a new and tasty way to prepare lean chicken and nutritious veggies. Meals that are high in protein and fiber, like this, are exactly what you need to be eating in order to see amazing results. Season the chicken tenders with salt and pepper. Heat the olive oil in a large skillet, over medium heat. Add the chicken and cook, turning occasionally until browned. Transfer to a roasting pan. Add the vegetables to the skillet and maintain the heat on medium. Cook, stirring often, until the onion is translucent. Sprinkle in the flour and paprika and stir well. Bring to a boil and cook until the tomatoes give off their juices, about 10 minutes. Pour the veggies over the chicken and cover. Bake for 30 minutes, uncover and bake for an additional 30 minutes. Nutritional Analysis: One serving equals: 211 calories, 3 fat, 390mg sodium, 17g carbohydrate, 5.5g fiber, and 29g protein. Correct Form/Posture – It should go with out saying, but it’s important that it must be said. Don’t do any unless you can do it with proper form and posture. If you can’t do it with proper form then learn. And if you don’t know how to learn, get to a professional who can help you get that form before you get into a serious workout program. Otherwise, you are just strengthening muscles around your bad habits/form, which will be much harder to fix and pose the threat for injury and muscles imbalances. AND DEFINITELY DON’T ADD WEIGHT TO MOVEMENTS WITH BAD FORM! Anything Behind the Head – Pushing or pulling anything behind your head (as in a lat pull down or military press with a barbell) places your shoulders in the perfect position for dislocation. If there is added weight, you are also putting a lot of stress on the tendons of your rotator cuff. These exercises are just as effective and safer to do in front of your head. Upright Rows – Even though you may not feel pain initially when doing this exercise, the upright row rotates your shoulders inward while elevating them, which stresses the rotator cuff and greatly increases the risk for shoulder impingement. Jumping/Plyo (too soon) – Plyometric exercise are a fun and exciting way to get the heart rate up and burn tons of calories as you are using both superficial and deep muscles in the lower body and core. However, jumping and more importantly landing place a ton of stress on your ankles, knees and hips (up to 8x as much force). Before you start jumping, make sure you can squat properly first. Then talk to your trainer about a training program that will progressively move you from a squat to a serious plyometric burn. KB Swings – Kettle Bells are gaining popularity in gyms and boot camps all over the country. And while they are great pieces of equipment with potential for huge gains, there is also the huge possibility for injury if done incorrectly. The kettle bell swing is a total body workout combining balance, strength, posture breathing and endurance. Make sure you learn KB techniques and form from a qualified kettlebell instructor. Even one of the most known female trainers is clueless and has horrible form when it comes to KB swings. So be sure to get a QUALIFIED TRAINER. Leg Extensions – The leg extension machine has long been a popular machine in the gym for sculpting the quads. However, it is also one of the worst for your knees! As the knees are locked in and the shin is moving forward, the patella is drawn backwards increasing compression forces on the knee joint, which can cause damage to the connective tissue, ligaments and cartilage. It can also cause pain anteriorly in the patellar tendon, especially for people with existing knees problems. Machine Exercises All The Time – Motivating yourself to get in the gym by yourself is a positive and I applaud you for doing so. However, if you are uncomfortable in the gym and only use “the machines” for your workout, you could be setting yourself up for injury. Yes, the machines are good for building up the muscles that the picture on the machine shows you. But the problem is that by constantly sitting in supported chairs or lying on supporting benches with the machine dictating your movements you fail to use your core muscles to support you body. Most of your stabilizing muscles around the big movement muscles and that joint are also taken out of the equation so they don’t develop! So once you get off that machine and try to use though newly developed muscles out in the real world, they are more than ready to go, but all the muscles to support them and the joints around them won’t be up to the task, causing serious injuries to your back/core or the joints (most commonly shoulder and hips). Don’t work through Pain – If a movements hurts, STOP. There is no room for negotiating or pushing through the pain. If it hurts, there is something wrong with the movement. Maybe form, maybe posture, maybe the movement itself. Regardless, you don’t want to push through it or you risk severe injury, tears, or muscles damage. Make Sure To Rest – Our bodies are definitely the most advanced piece of “machinery” around. However, all “machinery” needs rest and maintenance. So to avoid over use injuries and to ensure proper muscles/tissue recovery, make sure to implement rest into any workout schedule. Otherwise, all the work and gains you’ve made will be lost as you are stuck sitting on a couch recovering from a severe injury. Work the entire body, not just one muscle group – We all know the people who work only the vanity muscles (chest and biceps) since those are the most visible. But if you want to avoid pulling muscles and muscle imbalances (which effect posture, form, alignment, and feeling “good”), make sure you work all of your muscle groups equally to avoid tremendous amounts of strain on muscles, tendons and ligaments, causing irritation, inflammation and even stress fractures. Start easy and slowly build/don’t lift too heavy – If you are just starting, or just getting back into exercising or lifting weights, make sure to start slowly. Ligaments and tendons grow a lot slower than muscles do, so to ensure they stay healthy and avoid pulls and tears, start slowly so the muscles, ligaments and tendons can all grow together. Pushing your body beyond its ability to adapt will result in illness or overuse injury. Preheat oven to 425 degrees F. Place the asparagus, carrot, onion and zucchinis in a large bowl, mix well with the olive oil and salt and pepper. Place on a baking sheet and roast for 20 minutes, stirring after the first 10 minutes. Meanwhile place the remaining salad ingredients into a large bowl. In a small bowl combine all of the dressing ingredients and whisk with a fork. 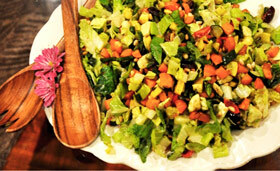 Once the veggies are roasted, mix into the salad bowl and toss with the dressing. Nutritional Analysis: One serving equals: 148.3 calories, 8g fat, 182mg sodium, 20g carbohydrate, 5g fiber, and 5g protein. If you plan to chow down tonight at a big chain restaurant, there’s a better than nine-in-10 chance that your entree will fail to meet federal nutrition recommendations for both adults and kids, according to a provocative new study. A whopping 96% of main entrees sold at top U.S. chain eateries exceed daily limits for calories, sodium, fat and saturated fat recommended by the U.S. Department of Agriculture, reports the 18-month study conducted by the Rand Corp. and funded by the Robert Wood Johnson Foundation. “If you’re eating out tonight, your chances of finding an entree that’s truly healthy are painfully low,” says Helen Wu, assistant policy analyst at Rand who oversaw the study. It examined the nutritional content of 30,923 menu items from 245 restaurant brands across the USA. “The restaurant industry needs to make big changes to be part of the solution,” she says. The restaurant industry is “employing a wide range” of healthier-living strategies, says Joan McGlockton, vice president of food policy at the National Restaurant Association. Among them: putting nutritional information on menus, adding more healthful items and launching a 2011 program at nearly 100 brands in more than 25,000 locations that offers children’s meals in line with 2010 dietary guidelines. Even then, the restaurant industry-supported “Healthy Dining” seal of approval is too generous on sodium, Wu says. 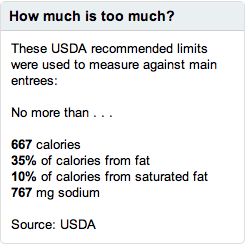 It allows up to 2,000 milligrams of sodium for one main entree, while the USDA’s daily recommended limit for most adults is 2,300 milligrams, she says. •Appetizers can be calorie bombs. Appetizers — while often shared — averaged 813 calories, compared with main entrees, which averaged 674 calories per serving, Wu says. •Family restaurants fared worse than fast-food. Entrees at family-style restaurants on average have more calories, fat and sodium than fast-food restaurants. Entrees at family-style eateries posted 271 more calories, 435 more milligrams of sodium and 16 more grams of fat than fast-food restaurants, Wu says. You want to lose weight, and have been trying hard for months without success. You’ve heard fitness people refer to ‘eating clean’ but what does that really mean? The labels on hundreds of different food items proclaim to be ‘healthy’ but can you trust labels? There are so many misconceptions when it comes to what constitutes as clean eating. What are you eating wrong? Let’s dispel the myths and outline your simple, straightforward 3-step guide to eating clean and watch as the pounds melt off. Your worst enemy in the fight against weight gain is packaged foods. Yes, even those packages that are described as ‘healthy’. Sweets: Cookies, brownies, muffins, cupcakes, donuts, candy and desserts. These packaged items are laced with sugar and bad fats, and lack any viable nutrient that your body actually needs. All the empty calories from these items will end up deposited on your waist and hips as stubborn fat. There’s never a good reason to eat these so-called foods. Processed Grains: Crackers, breads, cereal, chips, instant oatmeal, energy bars, and popcorn. This category is tricky because many of the packages are labeled as ‘heart healthy’ or ‘low fat’. The reality is that packaged, processed grains contain sugar and more carbohydrates than you need while striving to lose weight. If you have a weight loss goal then stay away from processed grains. Whole Grains: Brown rice, wild rice, whole oats, sprouted grain pasta, and sprouted grain bread. Here’s a category of packaged foods that you are able to include in your clean diet. You don’t, however, have a free pass to eat as much of these items as you’d like. Whole grains, while healthy and acceptable, are very calorie-dense. This means that a little bit goes a long way. Eat whole grains in moderation in order to meet your weight loss goals. Fresh vegetables and fruits are a huge part of your clean diet. The nutrients and fiber found in these natural food items are vitally important for your weight loss journey and your overall health. Eat a variety of fruits and vegetables in all shapes, sizes and colors. The only ones that you need to limit are vegetables that are high in starch, such as potatoes and corn, and fruits that are very high in sugar, like melons. The cornerstone of your clean diet should be lean protein. Great examples are chicken breast, albacore tuna, lean ground turkey, white fish fillet, whole beans, tempeh and egg whites. Protein is what holds your clean eating plan together, for two reasons. Protein satiates your hunger, keeping you full and keeping your blood sugar stable. This eliminates false hunger and prevents unnecessary snacking. Protein helps to grow and maintain your muscle mass, which increases your resting metabolism. This means that your body will be naturally leaner. For faster results, pair your clean eating with a challenging exercise routine. Call or email today and I’ll get you started on an exercise program that will make your goals a reality. These tacos are the perfect get-ready-for-beach-season meal. 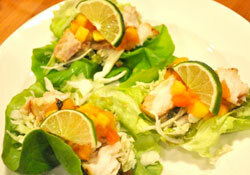 Flaky, protein-filled fish topped with mango salsa and wrapped in a crunchy guilt-free lettuce leaf. It’s flavorful, satisfying and will keep you on track with your fitness goals. Marinate the cod fillets in dressing for 20 minutes. Preheat oven to 375 degrees F. Grease a pan with olive oil. Place marinated cod in prepared pan, cut lime in half and squeeze juice over cod. Bake for 15 minutes. While cod is baking, separate leaves from lettuce, being careful to keep them intact. Assemble individual tacos by putting a tablespoon of guacamole on a lettuce leaf, topped with 1/4 cup of cabbage. Once fish is done, change oven to broil for a few minutes, watching closely until top is browned. Remove from oven. Top each prepared taco with a piece of fish, a spoonful of salsa, and a slice of the remaining lime half. Nutritional Analysis: One serving equals: 141.5 calories, 2.5 fat, 61mg sodium, 4.8g carbohydrate, 1.2g fiber, and 23g protein. have age-appropriate portion sizes and be calorically appropriate for age (kindergarteners to fifth-graders’ meals must contain 550 to 650 calories; and meals for for ninth to 12th-graders must have 450 to 600 calories). These standards, which mark the first such changes to school meals in more than 15 years, go into effect July 1 and will be phased in over a three-year period. Nearly 32 million children who eat at school will benefit. To support the changes, schools will receive another 6 cents, per meal in federal funding. School nutrition professionals and health advocates have been awaiting the release of these standards since President Obama signed the Healthy, Hunger-Free Kids Act in December 2010. In fact, many school districts across the country have already begun to make changes to meet the guidelines, which are largely based on recommendations by the Institute of Medicine of the National Academies, as part of efforts to curb childhood obesity in the United States. Seventeen percent in children in the country are obese. Feeling kind of stressed? You’re not alone. Stress is an inevitable part of our modern existence. Whether you’re the president of a Fortune 500 company, a Kindergarten teacher or a construction worker, you have stress to deal with. But you don’t have to let it get the best of you. By battling stress in your day-to-day routine, you can stop pulling your hair out and get back to living a more relaxed life. How can you turn your stress-filled life on its head? Working Out Works: When stress is getting you down, you need something to kick you out of your funk. You need something that makes you feel good. Because every time you exercise, you increase your body’s production of endorphins. In case you didn’t get the memo, endorphins are responsible for those good moods you get in after a race or the euphoria you feel while chomping down on a piece of chocolate. Best Bets: Now that you know exercise reduces stress, you may be wondering which exercises will be most likely to keep you from banging your head against the wall. Ready to learn what exercise you should be performing as you wage war against stress? Here it is: whatever you enjoy doing. That’s right – any and all exercise you perform helps you fend off the effects of stress. So whether you enjoy jogging, lifting weights, playing basketball, practicing ballet, swimming, yoga, rowing, or boxing, simply getting involved in your exercise of choice is sure to help reduce your stress. Through the Brick Wall: Working out every day and not getting the stress relief you so eagerly desire? Then it’s time to do things a little different. If all you do is lift weights five days a week, you should add in tennis or racquetball a couple days a week. And if you’re all cardio all the time, it may be time to get off the treadmill and grab a dumbbell or two.